Balcony View - Give comments on view, noting if location of any obstructions was an issue. – Great view as centre hump, feels more closed in as solid dividing walls on this earlier version of Voyager class. Only half glass. Quiet Stateroom? 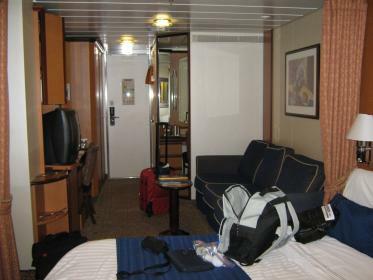 (With comments on problems) – Stateroom was quiet with no significant noise heard. Close enough to elevators without being bothered by stairwell noise, etc. Was stateroom a connecting stateroom? –Yes. Connecting stateroom is 9334. Balcony View - Give comments on view, noting if location of any obstructions was an issue. – Slight obstruction to the left, since it is right next to a hump cabin. Was wind a problem? –No. Any specific problems with this cabin? – No problems whatsoever. Any other comments? –We loved the cabin and location so much we booked it (and the adjoining cabin) again for July 2011. My mother and her friend were in the adjoining cabin and with the door closed we could not hear their conversations. Cabin steward was okay. Balcony Size? Normal or oversized for class? 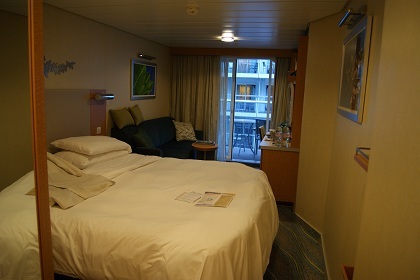 - The balcony is a bit wider than normal, wider than the cabin! There's a covered space, great for napping on the lounger. (The 1096 didn't have a lounger!) There was a larger patio table, too, plus 2 regular chairs. Was wind a problem? -No. If an aft cabin, was soot a problem? -No. Any specific problems with this cabin? -Very, very long walk back and forth to the cabin! Any other comments? -I was very nervous about this cabin and the "obstruction"..I shouldn't have stressed...it was lovely! Any other comments? - This cabin has a very large window. It was really great to sit on the bed and watch the dolphins jump the waves going into Cabo and back out. 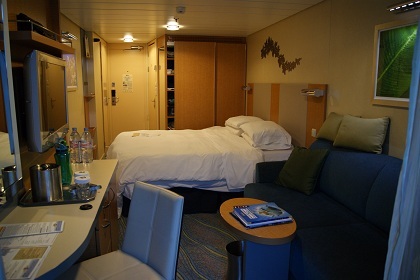 Another thing is that it is really quiet as there are only 8 staterooms in this area and it's a dead end. Wow!! Lots of great cabin photos and info. Here is the 1st PDF. I am going to be out of town for the next couple of months, so I will be adding another later on towards September. Quiet Stateroom? (With comments on problems) – Yes, muffled music from Centrum every once in a while (especially on 70s night) but not disturbing in any way. Balcony View - Give comments on view, noting if location of any obstructions was an issue. – Excellent view, no obstructions, could see up, down and all around. Any specific problems with this cabin? - LOVED this cabin! Center of hump, great location near stairs & elevators and a great view from balcony. Would definitely book this room again. Any other comments? Serenade is a beautiful ship and very clean. 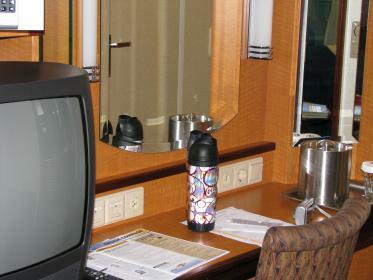 I thought the room was very tastefully decorated compared to other ships I've been on. Balcony View - Give comments on view, noting if location of any obstructions was an issue. – Balcony view was WONDERFUL. Took a chance on enjoying the aft view and was not disappointed. A little bit of the ship's superstructure was visible but we quickly looked past this and really enjoyed the 180 degree view of the ocean as we sailed. Balcony Size? Normal or oversized for class? - LARGE- I would say probably 4 to 5 times as deep as a normal side balcony. We had 2 pool loungers, a pool chair/ottoman as well as 3 table chairs and a decent sized patio table with plenty of room to spare. Was wind a problem? - Not at all, as a matter of fact on the very windy days coming back to LA we enjoyed the sun on our balcony without the wind being a problem. If an aft cabin, was soot a problem? - No soot at all. Any specific problems with this cabin? - Great cabin!!! Any other comments? -Take the aft and enjoy. It really was like being in a world of our own. We rarely used the pool but did use our balcony a bunch. Balcony View - Give comments on view, noting if location of any obstructions was an issue. – No obstruction--great view. We were near the front so if you looked forward and up we could see the wing of the bridge and often there was an officer or someone right there. Balcony Size? Normal or oversized for class? - Normal and it was fine. We asked for a third chair since there were three of us. Our room steward got one on the second night and there was plenty of room. Was wind a problem? - No--other than the 50-80 mile an hour winds we went thru in the tropical storm! Any specific problems with this cabin? -None at all. Very comfy beds, not an abundance of room but we expected that. Any other comments? - Just an idea--we were two adults and my 16 yr old son. He used the pullman to sleep on and that allowed us to keep the sofa under it for sitting--even when the pullman bed was pulled down. It worked great and he said it wasn't bad sleeping there. I only bumped my head once and that is because I am clumsy!!! We did pull out the sofa bed once just to see how big it was and it really did take most of the remaining space in the room so this was a better option for us. I thought storage would be a problem at first but we were able to unpack everything and even had a shelf in the closet that we didn't use. All luggage fit under the bed easily. Quiet Stateroom? 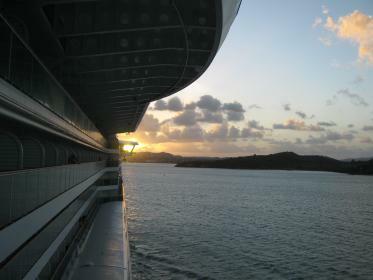 (With comments on problems) – Quiet yes however the toilets throughout the ship can be heard when flushed. Any specific problems with this cabin? - Keyboard for interactive TV did not work. Probably fixed by now though. Any other comments? - Pictures taken September 2010 on a B2B. Balcony View - Give comments on view, noting if location of any obstructions was an issue. – The view was great and there were no obstructions. Balcony Size? Normal or oversized for class? - Normal with 2 regular sized chairs and a small table. Any specific problems with this cabin? - The bathroom seemed to have a sewage smell primarily from the toilet of course but it wasn't a major issue. Any other comments? - The size of the room was adequate for two people and there was ample storage space for luggage. The room also has a sofa which was good for lounging or watching tv but does not have upgraded flat screens yet. The bathroom and shower were small but counter space was sufficient for toiletries. Balcony View - Give comments on view, noting if location of any obstructions was an issue. – Located at the rear of the hump....which in hurricane force winds it was a PLUS! Balcony View - Give comments on view, noting if location of any obstructions was an issue. – Being in the center of the hump, great views for full 180 degrees. Any specific problems with this cabin? - They are changing out the Plasma TV's for LCD flat screens, which are smaller and look a bit ugly. They could have painted the housing of the unit black to make the wood disappear. Any other comments? - No DVD or CD player. The old ones are not compatible with the new TV's. Also, they are trying new energy saving light bulbs in the bathroom. It quite dark, compared with the way they used to be. However, with the mirror lights on, there is still plenty of light. This unit is just off of the elevator, and is very easy to walk up one flight of stairs to pick up breakfast from the WJ and bring it back to the cabin. A nice dining table with 4 chairs for meals. Also, just down one flight and a very short walk to the Concierge Lounge. It's our favorite cabin on a Voyager Class ship. Balcony View - Give comments on view, noting if location of any obstructions was an issue. 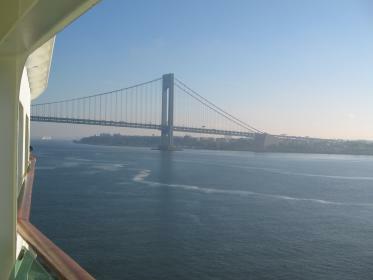 - Center hump balcony, great views from all angles. Any other comments?This cabin is huge, I think it's even larger than other Junior Suites. It has tons of storage space, a walk-in closet, and a bathtub. If it means anything, I have scored this cabin three times out of my four times on Mariner. The other time I was in an OS...1314. Quiet Stateroom? (With comments on problems) – Very quiet! actually in the middle of the ship. This cabin is great for folks with motion sickness. Just steps away from elevators/stairs. No noise issue at all. Would book it again! Any other comments? - Plenty big enough for 2 people with 3 suitcase full of clothes. Had a sofa and small table, plenty of space on the vanity, had old tube tv and lots of cloet space. Quiet Stateroom? (With comments on problems) – Very quiet, except when neighbor's toilet is flushed :). During the day if you open the balcony door the band that plays on the pool decks is right above you and you can enjoy the music! Balcony View - Give comments on view, noting if location of any obstructions was an issue. – Wonderful view of Central Park overlooking the Park Cafe. Balcony Size? Normal or oversized for class? - Normal size, plenty of room. Any specific problems with this cabin? - No, great cabin. Any other comments? - Very comfortable bed, I miss it! Bed is by the closet. Hubby and I had two large suitcases packed to the max and had plenty of room in the closet and on the closet shelves for all our clothes. Used the desk drawers for misc stuff. We thought there was a lot of storage options, and ones we didn't use. A quiet piece of heaven on the Oasis! You will be happy to have this cabin! See the attached pictures.